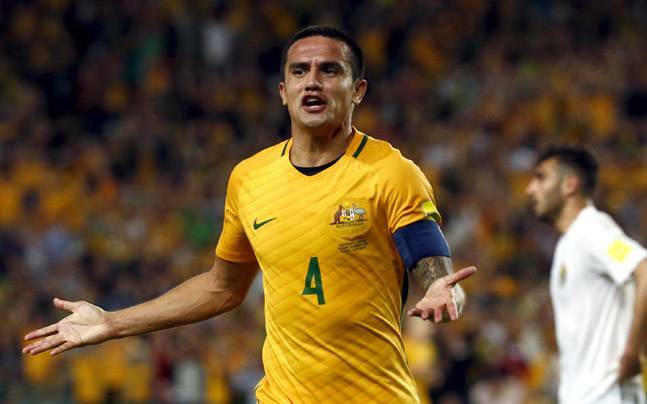 Tim Cahill has been dropped by Australia coach Ange Postecoglou for the Socceroos' upcoming World Cup qualifier against Thailand as part of four changes to his squad. Postecoglou amended his previous 30-man squad to 23 on Wednesday, November 2nd with Brisbane Roar striker Jamie Maclaren being given a late promotion after scoring his opening goal of the A-League season against Perth Glory. FC Tokyo striker Nathan Burns, Perth Glory defender Josh Risdon and 1860 Munich defender Milos Degenek were also recalled into the squad. The 36-year old Cahill has been left out of the squad for the match in Bangkok on November 15 as the forward looks to fully recover from soreness that saw him miss Melbourne City's win over Adelaide United. Australian squad further omitted ApostolosGiannou, Chris Ikonomidis and Ryan McGowan during their clashes with Saudi Arabia and Japan in October. "Tim has been left out primarily because we have a 10-day lead in, which is very rare, and I want to be able to put the squad through a lot of work," Postecoglou made known in a statement. "He [Cahill] has done a lot of travelling for club and country and I have decided it is better he remains in Melbourne where he is being managed well to ensure he is back on the park as soon as possible and ready for us down the track." The coach further explained that Jamie Maclaren has begun the season well in Brisbane and transformed that form into a goal on the weekend so he will appear in the squad to give them options in front. The other players to miss out from the preliminary squad are Aziz Behich, Luke Brattan, Jason Geria and Tommy Oar, whereby the coach believes the Australia team will for real miss their appearance.